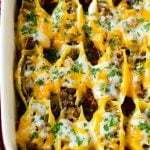 This recipe for Mexican stuffed shells is jumbo pasta stuffed with taco meat, then covered with cheese and baked for perfection. 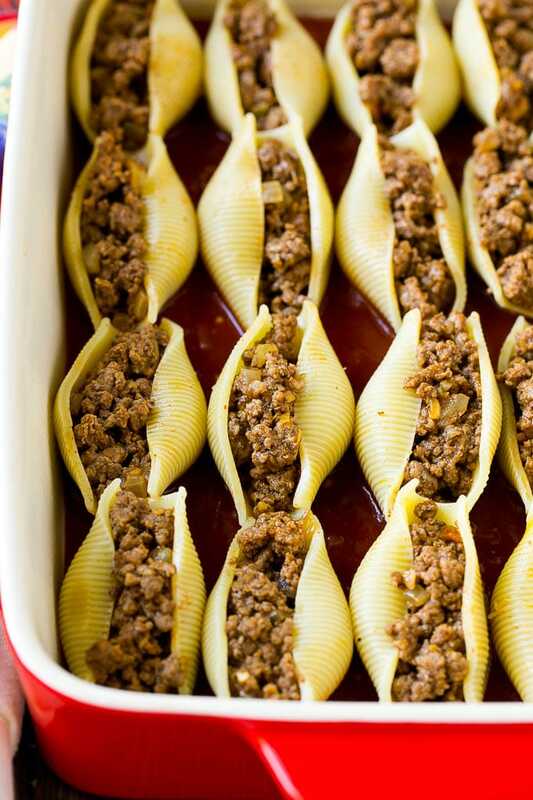 A fun twist on classic stuffed shells that the whole family will love! Stuffed shells are a family favorite in my house, including chicken alfredo stuffed shells and pizza stuffed shells. This latest addition is full of zesty Mexican flavors and makes for an easy and hearty meal. Stuffed shells are one of those recipes that never goes out of style, they’re comfort food at its finest! 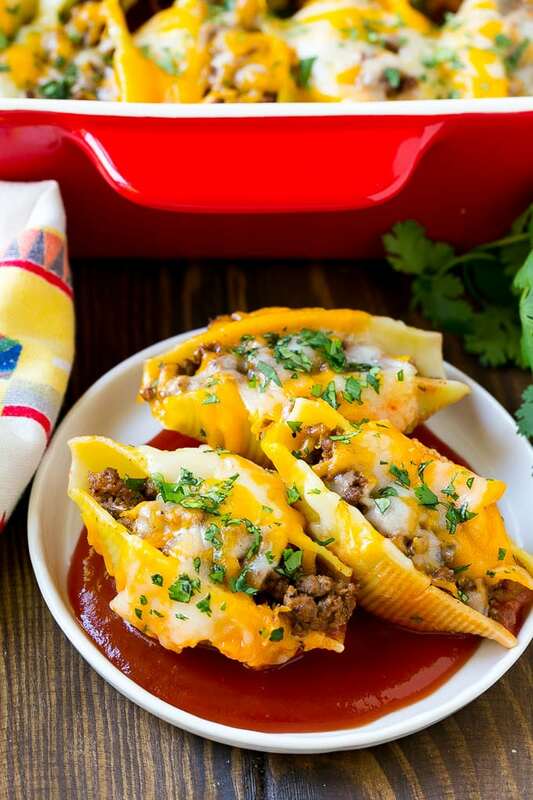 These Mexican stuffed shells are filled with ground beef, topped with plenty of cheese, and baked in a Mexican style salsa sauce for a fun and unique take on pasta night. How do you make Mexican stuffed shells? 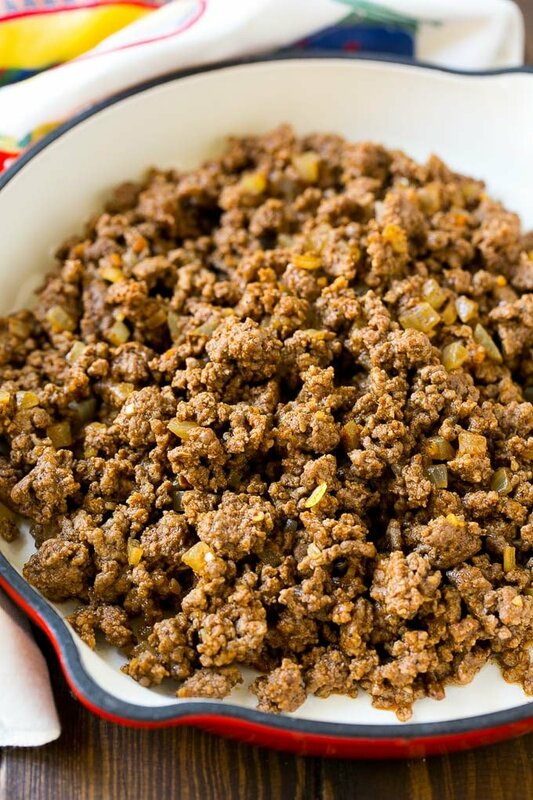 The first step is to cook your filling, which is made up of ground beef, onions and taco seasoning. 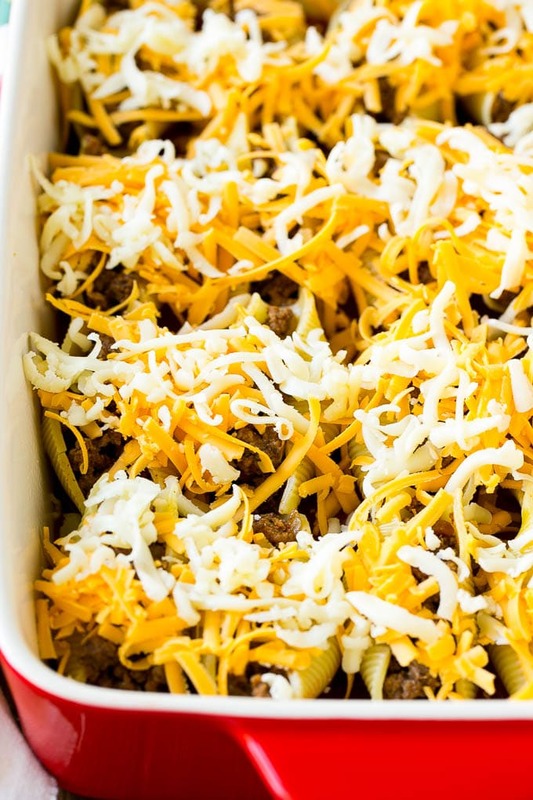 The meat mixture gets stuffed into pasta shells, and then the shells get nestled into a zesty sauce made from salsa and taco sauce. You can cook your filling up to one day before you plan to bake your shells. I always put my shells in boiling water at the same time as I start cooking the beef, that way everything is done at the same time. You can use ground turkey or chicken instead of beef if you prefer. The sauce is a mixture of mild salsa and taco sauce. You can also use enchilada sauce or a spicy salsa for a different flavor take. These shells can be assembled up to 8 hours before you plan to bake them. Simply cover the pan and store in the refrigerator until you’re ready to heat them up. You will have to increase the bake time accordingly. You can use your favorite kind of cheese for these stuffed shells. I used a combination of cheddar and Monterey jack, but other great choices are pepper jack or colby jack. I typically serve this dish with a simple steamed vegetable on the side. If you’re looking for a heartier side dish option, try pinto beans and Mexican rice. 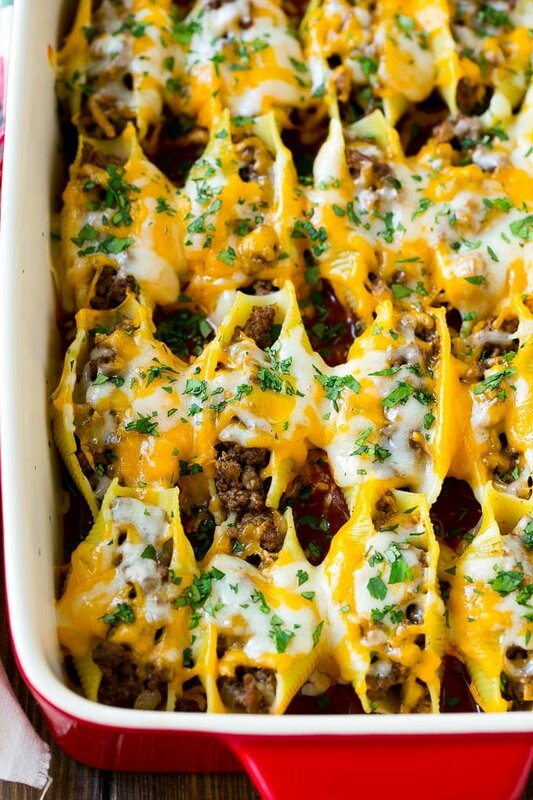 Mexican stuffed shells are a super unique and filling dinner that’s perfect for feeding a crowd. I often take a pan of these shells to potlucks and they’re always the first thing eaten. You will have everyone asking for the recipe! Preheat the oven to 375 degrees. Coat a 9" x 13" pan with cooking spray. Place the taco sauce and salsa in a bowl and stir until combined. Spread the salsa mixture in an even layer at the bottom of the prepared pan. Heat the vegetable oil in a large pan over medium heat. Add the onion and cook for 3-4 minutes or until translucent. Add the ground beef and taco seasoning to the pan. Cook, breaking up the meat with a spatula, for 5-6 minutes or until beef is cooked through. Fill the pasta shells with the beef mixture and place them in the pan on top of the salsa sauce. Sprinkle the cheese over the top of the shells. Bake, uncovered, for 20 minutes or until cheese is melted and sauce is bubbly. 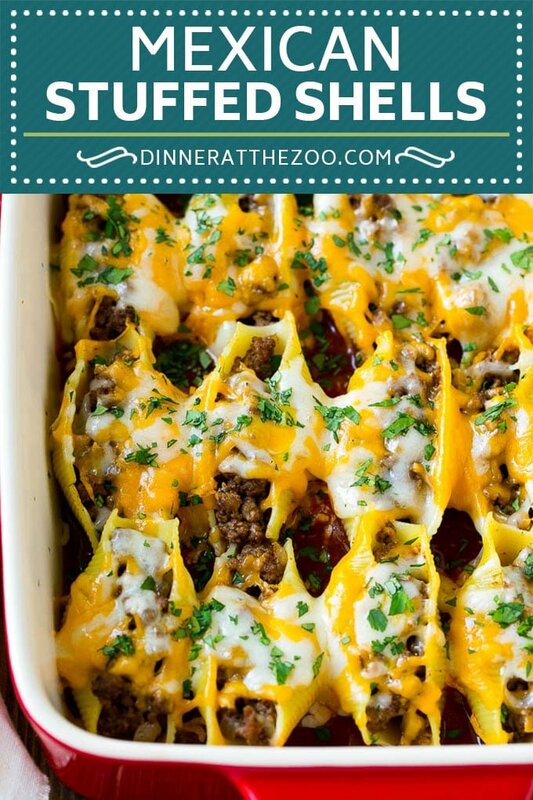 Stuffed shells are always a family favorite and I know we will love these with a Mexican twist. I mean who wouldn’t love their favorite Mexican flavors in a pasta shell. Great idea! These were delicious!!! My daughter loves pasta and Mexican food. So easy and fast. Thank you!!!! My mom made stuffed pasta shells quite a bit growing up and I haven’t made them is so, so long! I love the Mexican twist here and the great ip to make the filling the day before! Oh wow! I may have just died and gone to Heaven. These look so fantastic! I want to make them now! This dish reminds me of Mexico, one of my fave places to be! Looks so yummy! I love stuffed shell recipes already but this Mexican stuffed shells recipe is a break from the ordinary. I love it! These stuffed shells look wonderful. I love all the flavors. I bet my husband would love this. Saving! Wow. This looks delicious. Meats and pasta are a favorite in my home. Will try making it this way in our next pasta dinner rotation. Yum!! These stuffed shells look bonkers good!! My husband would go nuts for them. Adding them to my list of “must make” recipes right now. These look really good I bet my toddler would love this! Her favorite food is pasta but the rest of the family gets tired of eating it the same way all the time. I will definitely have to try this recipe! I’ve been looking for something new to add to the menu on #TacoTuesday. This dish is perfect. Everybody loves stuffed shells, don’t they? I’m so happy to hear everyone loved it, thank you for reporting back! Pasta shells right? Are they cooed first? Yes pasta shells and they are cooked first!